Photograph shows the lilac hedge at Elmwood Park. Photographer's stamp on verso. Date of photograph is approximate, [ca. 1920]. Photograph shows footbridge in wooded area, taken during the fall season. 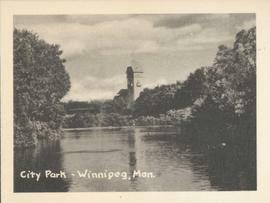 One of three photos mounted on page with caption "Scenes - Kildonan Park." Date of photograph is probable, [1923? ].